In Jane Austen’s time, Christmas was celebrated from December 6th to January 6th. The Regency Christmas was not celebrated with the same grandeur as it is today; there was no Santa and no stockings, and Christmas trees and cards did not become widespread until the Victorian era decades later. It was a time of charity and goodwill. Christmas feasts were common in Jane Austen’s days. Emma and her circle of friends are all invited to Randalls, Mr and Mrs Weston’s home, for dinner at Christmas. Mr Elton says (Chapter 13), "This is quite the season indeed for friendly meetings. At Christmas every body invites their friends about them, and people think little of even the worst weather. I was snowed up at a friend's house once for a week. Nothing could be pleasanter. I went for only one night, and could not get away till that very day se'nnight." "Immediately surrounding Mrs. Musgrave were the little Harvilles, whom she was sedulously guarding from the tyranny of the two children from the Cottage, expressly arrived to amuse them. On one side was a table occupied by some chattering girls, cutting up silk and gold paper; and on the other were trestles and trays, bending under the weight of brawn and cold pies, where riotous boys were holding high revel; the whole completed by a roaring Christmas fire, which seemed determined to be heard in spite of the noise of the others." Lady Russell remarks, "I hope I shall remember in future not to call at Uppercross in the Christmas holiday." At the time, Christmas decorations were not quite as elaborate as they are these days. As we read in the previous passage, gentlefolk obviously used silk and gold paper to decorate their homes. It was also common to decorate the house with greenery, such as holly, mistletoe, rosemary, bay and laurel. Candles and fires were also an integral part of the Regency Christmas. The 12th Night, marking the end of Christmas, on January 6th, was certainly a grander celebration than Christmas Day. On the 12th Night, families would get together for a feast and have a special cake. What a wonderful way to end the Christmas season! For those interested in learning more about the Regency Christmas, the Jane Austen Centre in Bath are hosting an exhibition on how Christmas was celebrated in Jane Austen’s days. The exhibition will continue until 31 December 2010. Read more about the exhibition here. You can read more about the Georgian and Regency Christmas on the Jane Austen Centre website here and here. 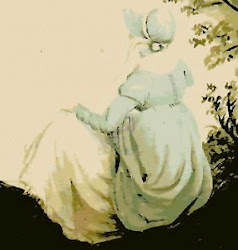 Jo Beverley, author of many romantic Regency Christmas stories, has written a thorough article on the Regency Christmas. To learn more about the 12th Night celebrations, you can visit Austen Only and the BBC History website. To learn about Christmas games and food, you can visit the Christmas Archives and the Literary Liaisons. To read about Christmas decorations, visit Jane Austen’s World and Austen Only. Thank you for this detailed research Anna. I feel hungry, infact my mouth is watering at the prospect of that cake above, and the Christmas repast that Marilyn and I are going to prepare over the next two days for our family. What traditions do you have in Finland? One of my brothers, Michael, has lived in Denmark for the last 30 years. He and his family live on Jutland near Grenaa so I know all about their customs. Merry Christmas, Anna. What a lovely post! Thank you, Vic : ) Hope you have a great one, too! The Charming Villain Vs The Boring Hero?